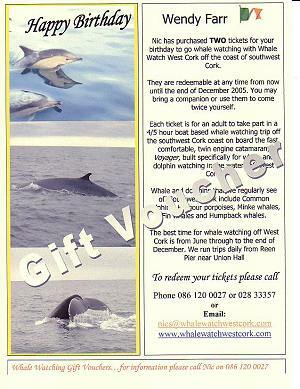 Gift Vouchers for Whale and Dolphin watching are available for Christmas, Birthday or that special occasion. Vouchers may be made out for one or several people. There is €10 postage and preparation charge for each gift voucher plus €50 charge for each person. We will send the voucher recipient a personalised, pre printed certificate indicating who has bought the ticket/s for them, including any special message you would like to include and indicating how many people are included on the voucher. These make an unusual gift ideas for families, couples or that single friend or relation. Whale and Dolphin watching Gift Vouchers remain valid for an entire year and may be redeemed at any time by the recipient. 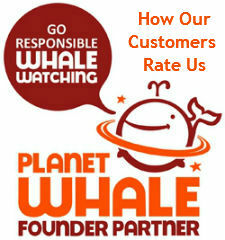 Click here to see more Whale & Dolphin gift ideas in our online shop!